Quick Start Guide for the RoMac 10 Band Equalizer 2012 Software. The RoMac 10 Band Equalizer requires a full duplex, 16 bit sound card installed in your computer. Full duplex means that the card can record and playback at the same time. 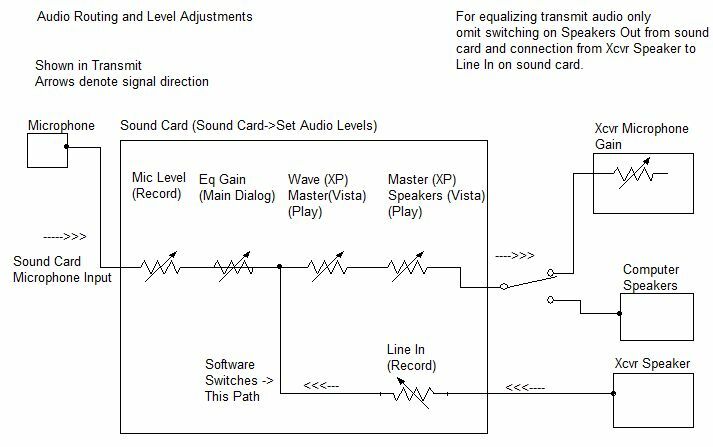 To take advantage of both the transmit EQ and the receive filtering, the sound card requires separate Microphone and Line In inputs. Most sound cards today meet this requirement, even sound cards built in to the mother board. Here is an overview of the typical routing of audio. 2.) Set the Mic Gain on the main dialog to about 50. 3.) Cable a microphone to the Microphone Input to your sound card. Use a stereo jack and wire the hot side of the microphone to the tip, and the ground to the sleeve. Leave the ring unconnected. Balanced microphones, wire the plus to tip and the minus and shield to the sleeve, leaving the ring unconnected. To use the software for receive audio, cable the receiver audio to the "Line In" on the sound card. The receive filtering options can be found at "Setup->Receive Settings"
If you are going to use the software for just equalizing your transmit audio, you don't need to hook up your receiver audio to the sound card. When the equalizer software is in a Tx mode (Tx Only or Noise Gate) the software uses sound card's audio coming in the "Microphone In". When in a receiving mode, the software uses audio on the "Line In" device. The software automatically selects proper input according to the PTT Mode. To reverse this logic, simply reverse the "Line Input" and the "Microphone Device". While speaking into the microphone you should hear yourself in the speakers. There should be a slight delay in the audio. This is due to the processing overhead of the audio stream. This delay may be reduced by selecting "Small Buffers" and reducing the sampling rate on the sound card. These options are located at 'Sound Card->Select Sound card". If you also hear an "Echo", make sure the Microphone on the Playback side is muted. If you hear yourself clearly and there are no dropouts of the audio, your sound card should work. If you don't, see Sound Card Trouble Shooting in the Help File. If your sound card works in the "Xmit Only" Mode it will work in the receive mode just fine. Don't confuse delayed audio feeding back into the microphone as an echo. Some very sensitive microphones will pick up the audio from your speakers and will sound like an echo, although this echo will be much reduced in volume. This may happen even when using a boom headset, today's microphones are very sensitive. Many times when someone hears what they perceive as an echo, they will turn the volume up on the speakers, making matters worse. Best to use headphones, or keep the speaker volume down. If everything seems to be working, you will need to interface your sound card output (Speakers) to the Mic input on your transceiver. Click here to see some samples of interfacing your sound card to your radio. There are numerous commercially made interfaces on the market and there is a wealth of information on the internet on various way to interface your sound card to your radio.